Oh dear! Hal Jordan has made a very bad decision, hasn't he folks? In fact, his decision is so bad, I have to try my best not to mention it for the remainder of this article. Damn you Robert Venditti, Billy Tan, and Rob Hunter! Why did you do this to me and the Publisher: DC Comics, in November, 2013? All I wanted to do was to be your friend! Sob! Using GENERAL terms, answer the following 4 questions about this STORY entitled 'Resistance'. 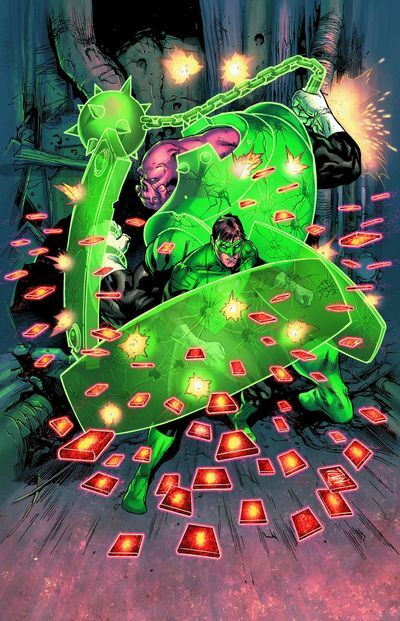 WHAT'S THE MAIN THRUST OF THIS TALE: In the aftermath of the 'Lights Out' saga, Hal Jordan unintentionally pisses off the Green Lantern Corps by issuing a new directive, stating that they should police every member who slings their rings. ARE THE MAIN OBJECTIVES ACHIEVED: Well, let's just say that a start is made when Hal and Kilowog take on Nol-anj plus her gang on the planet Dekann. ANYTHING ELSE HAPPEN: Yes. Carol flips Hal the bird. Tut-tut-tut! HOW DOES THIS STORY END: With an encounter not really going according to plan. 'Guess which finger I'm holding up'. Ha! What a nice way of making a statement. (+) One of the best bits about this adventure would have to be the ethical dilemma surrounding Hal's new directive, plus how everyone involved with it, took to this very bold move. I mean, to quote John Stewart, it is kind of hypocritical if you think about it. But then again, in the same breath, Hal's actions make an awful lot of sense if you take into consideration the consequences of the 'Lights Out' saga. See what I mean, folks? A comic book that makes you think is a smashing comic in my book. (+) Now I'm afraid to say that I'm not too sure about Billy Tan's artwork myself. Hey! Don't get me wrong. On occasion he really does know how to light up the page with his very dynamic visuals. Having said that, though, there are times that his layouts' don't seem to click for me at all, cause they have that rushed quality to them, that makes his stuff come across as a tad inconsistent in tone. (+) I loved that part where Kilowog punched Nol-anj in the face, despite her trying to damping his spirits with her power of love. Good on you, Wog! You show that b*ch who's the Daddy, and who's the... errr... hmmm... I have nowhere to go with this, do I? Viva La Wog!!!! (-) I suppose the only aspect about this issue I wasn't too thrilled about, would be how it's overall narrative was paced within its 'Three Act' structure. It started off with a slow plot-recap. It then sped up with a quick segway to the Nol-anj part of the tale. And finally it finished off with a speedy fight scene and a hell of a great cliff-hanger. UGLY-FRUIT AS KILOWOG: Come on. Let's face it. Kilo is a damn ugly looking bugger, isn't he? Even if he does have a nice yet sweet-center. 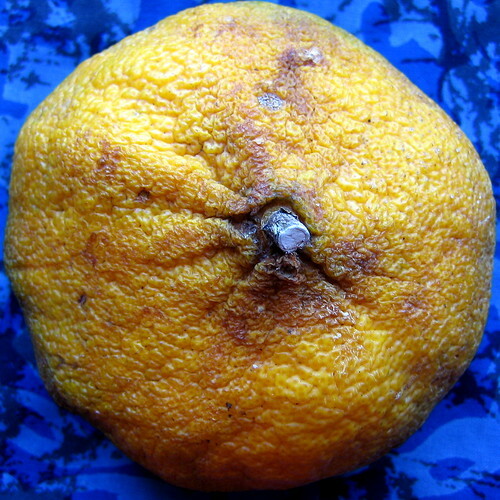 PASSION-FRUIT AS NOL-ANJ: What? Is this comparison too obvious for you, folks? Hey. Don't sweat it. Just take a bite out of this putrid looking plantae and relax, why don't ya! 'LOVE IS THE ENEMY' BY SKILLET: Alright. I admit it. I'm being a tad too literal again with my comparison. But come on. It does make some sort of sense if you think about it, huh? Hi. My name is Kilowog. And... errr... weeeeelllllll... please bear with me, OK? Cause this is the first time I've done this sort of thing. Anyway. So here goes. Take two. Hello. I'm Kilowog. I'm thirty-seven paraticlez in age. I work in the Green Lantern Corps. And I would like to meet a new partner. Granted. I know that I'm nothing to look at. Plus on occasion some people do mistake me for a cabbage or a cow. But I have a good heart you know. Heck. Once I even gave one of my hearts to a creature living on Vankoff-5, just so he could emolliate his hoof. Oh! Wait a minute. Let's start that again, shall we? That didn't sound right at all. Take three. Hello. My name is Kilowog. Thirty-seven paraticlez. I work in the Green Lantern Corps. And I would like to meet a new partner. I am a nice person at heart. And I have a very nice way about me. Honest. You just ask my boss, Hal, and he'd tell you how I punched this b*tch in the face when she was... was... was... oops! OK. Take four. Hi. My name is Kilowog. Thirty-seven paraticlez. I work in the Green Lantern Corps. And I would like to meet a new partner who would love me for who I am, and not for what I'm not. There. That sounded fine to me. Nuff said. Now go and buy this great book, cause I'm in it, sucka.